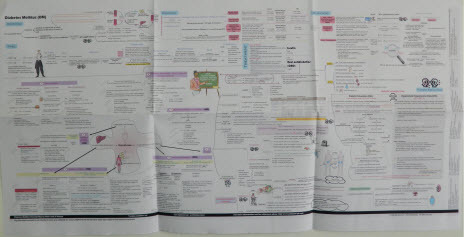 The map starts with Diabetes Mellitus (DM) definition which is a syndrome that is caused by absolute or relative lack of insulin, resistance to the action of insulin, or both. It is characterized by hyperglycemia and alteration in lipid and protein metabolism. This definition is linked with the normal physiology of insulin and glucagon secretion in response to blood glucose level (BGL). From DM definition, there are also links to symptoms of hyperglycemia and DM complications (including micro- and macrovascular complications). From these criteria, there are links to DM diagnostic tests including: Random Blood Glucose Test, Fasting Blood Glucose Test, Oral Glucose Tolerance Test (OGTT) /2-Hour Postprandial Test, and Glycosylated Hemoglobin (HbA1C), with a comparison of their relevant values of blood glucose level in cases of normal BGL, Impaired glucose tolerance (IGT), Impaired fasting glucose (IFG), Increased risk of diabetes mellitus, and values in case of DM. Although (MONITORING) part is usually mentioned in any reference at the end of the topic, it is mentioned in this map close to (Diagnosis) part to show differences between all tests used in diabetes and to clarify which ones that are used for diagnosis and/or monitoring. Tests that are used in DM monitoring are: Self / Home Monitoring of Blood Glucose (SMBG /HMBG), Glycosylated Hemoglobin (HbA1C), and Serum Fructosamine. Each one is explained and followed by normal values of BGL and values that indicate DM or inadequate glucose control. (Monitoring) part is also followed by explanations of screening tests that are usually used by diabetic patients. The first one is screening for glucose in urine, a condition that is called (Glucosuria) and the second is to screen for ketones in urine, a conditions that is called (Ketonuria). The other part of (Monitoring) is related to DM complications, when to start monitor for these complications and what monitoring tests are used. Age of onset - Onset - Risk Factors -Pancreatic Function - Pathophysiology - Clinical Presentation – Obesity – Complications – Treatment. Treatment of DM type 1 includes : insulin, diet, and exercise, while treatment of type 2 includes: diet, exercise, oral antidiabetics (OAD), insulin. 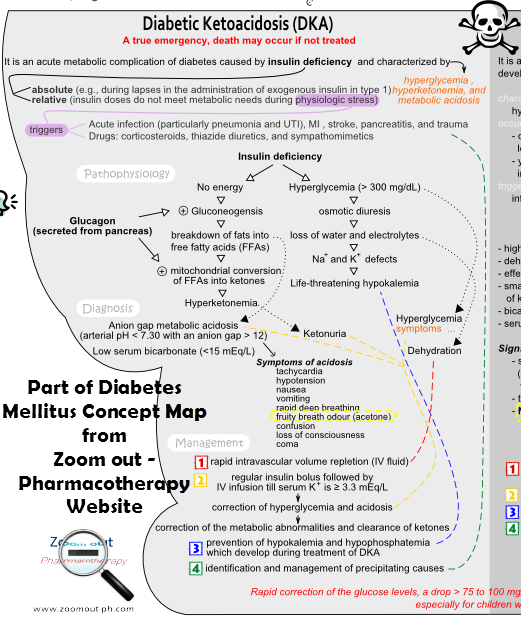 A mind map of diabetes mellitus treatment is included under (TREATMENT). The main function of this map is to differentiate between the sites of action of medications used in the management of DM, i.e. to show whether this medicine acts to stimulate pancreatic insulin secretion (Insulin secretagogues), decrease peripheral insulin resistance (Thiazolidinediones), decrease hepatic glucose production (Biguanides), or slow digestion and absorption of carbohydrates (α-Glucosidase inhibitors (AGIs)) …etc. Medications used in the management of diabetes mellitus are discussed in comparisons that involve their mechanisms of action, adverse effects, drug interactions, precautions, and contraindications if any. Lifelong insulin is required in all type 1 DM patients and it should be started immediately after diagnosis, unless patient probably will experience an acute complication of diabetes which is called “Diabetic Ketoacidosis” – DKA. It is a diabetic emergency that is caused by absolute or relative insulin deficiency. 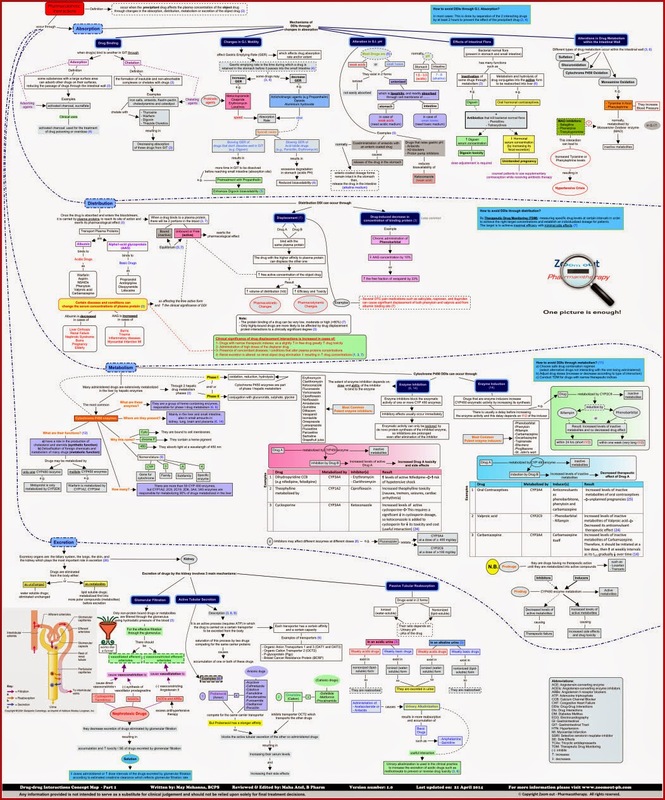 A separate concept map for diabetic ketoacidosis is included to give an overview of DKA definition, pathophysiology, diagnosis, and management. Next to DKA map, there is an overview of another diabetic complication called “Hyperosmolar Hyperglycemic State” – HHS which mainly occurs in type 2 DM patients. Differences between DKA and HHS are highlighted with dotted boxes. Risk factors of diabetes mellitus 2 including “insulin resistance syndrome” or “metabolic syndrome"
Modifications in diet and exercise should be adjusted individually, with different diet requirements for both types of DM. Treatment and prevention of complications and recommendations of using ACEIs, ARBs, aspirin, and/or lipid-lowering agents according to patient’s case. 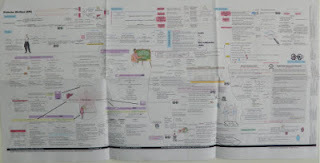 The map is split into pages to be printed on eight A4 papers. After printing them, you have to tape the edges together to make a folded poster. "American Diabetes Association Treatment Algorithm for Type 2 Diabetes." Pharmacist's Letter. November 2006. 11 May 2009. DiPiro, Joseph T. Pharmacotherapy: A Pathophysiologic Approach. 8th. The McGraw-Hill Companies , 2011.